As Guardians of the Galaxy 2 continues to prepare itself for a May 5, 2017 bow, we keep getting more info about potential new characters that will be added to the franchise in its second outing. And, it’s starting to look like one of Marvel’s strangest characters may be showing its giant, odd face in the new film. 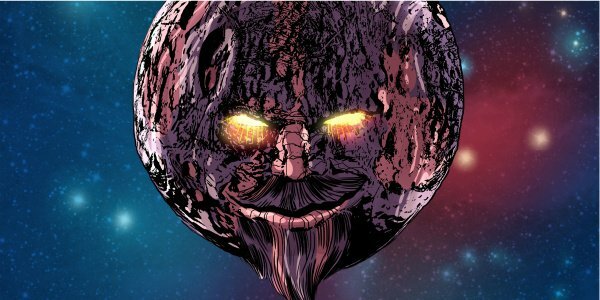 A report from Geek says that Ego, the Living Planet is likely to make an appearance in Guardians of the Galaxy 2. This would mark the first time Ego has been seen in any Marvel Cinematic Universe property, even though the character has a long history with Thor in the comics. Ego, the Living Planet first appeared in the comics in 1966. The planet resides in the Black Galaxy, and began as any planet does, coalescing from dust and cosmic gases over millions of years. When the Stranger (a mysterious, super-powered space wizard) came across the planet, he gave Ego consciousness. Stranger also gave consciousness to a second planet, known as Alter Ego, but gave him to the Collector, with the hope of one day pitting his two creations against each other to determine which was stronger. When Ego has an identity crises and heads off to consume space craft and conquer other planets, he pisses off Thor and is stopped by the God of Thunder. Later, when world-eater Galactus sets its sights on Ego, Thor returns to help defend him. After winning the battle, Ego and Thor call a truce, and Ego agreed to take a group of beings onto his surface. But, when Ego lost his mind, he devoured the beings, and Thor brought Galactus back to Ego to destroy him. Phew. That’s quite a story there, and that’s not even half of it. In the comics, Ego also crosses paths with the Fantastic Four, Silver Surfer, Professor X, Thanos and Iron Man. But, one character that crossed paths with Ego who really makes an impact for the purposes of Guardians of the Galaxy 2, is Rocket Raccoon. After Ego’s done raising hell all over the Milky Way, including an attempt to destroy Earth, his surface becomes infested with space lice (really), and he hires Rocket to exterminate them (really). While there’s no telling right now how the filmmakers might introduce Ego, the Living Planet into the Guardians of the Galaxy 2 universe, it’s clear that he has a lot of history to mine for story purposes, and that he could even end up being a minor foe for the intergalactic space heroes. And, if you think there’s no way a sentient planet could work in a Guardians movie, you’re simply not thinking hard enough. Ego actually fits there better than he would in a Thor or Iron Man film. After all, Guardians brought a tough little talking raccoon and a giant, sort-of-talking tree man to the big screen. If the filmmakers can make Rocket and Groot work, then Ego is right up their alley.